Laboratory Trolleys There are 4 products. 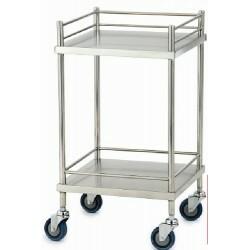 Labec specialises in the manufacture of stainless steel hospital and Laboratory trolleys in standard and custom sizes. Trolleys can be manufactured to hold multiple shelves and varied weights making the transport of items around the ward easy and safe. 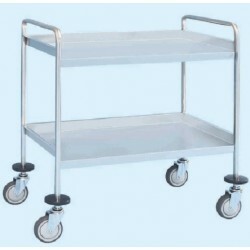 DESCRIPTION:A strong, multipurpose, laboratory trolley with 3 shelves. The trolley operates on large castor wheels. Two with brakes. Dims: 790mm x 490mm x 990mm (lxwxh). Distance between shelves: 330mm. Delivered flat packed, ready for assembly. 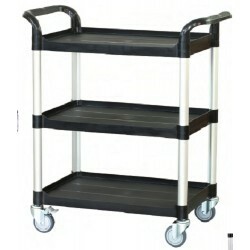 Material: Stainless steel end frame with polypropylene shelves. 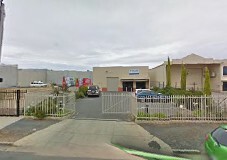 MANUFACTURERS OF STAINLESS STEEL EQUIPMENT SINCE 1966.